Made using Implant Grade Surgical steel (ASTM F-138). Hand polished to a mirror shine, Anatometal's surface finish is recognized as one of the best in the industry. Available in short (1"), medium (2 1/2"), and long (5 1/2"). 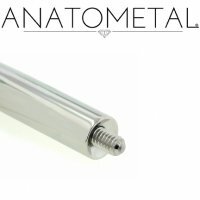 This threaded taper will fit 4 gauge Anatometal threaded barbells, circular barbells, labret studs or screw on ball rings. Length: 1", 2 1/2", 5 1/2"